Siweiluozi's Blog: Medical parole? What's it worth to you? Earlier today Zeng Jinyan, wife of imprisoned Chinese human rights activist Hu Jia, reported that prison officials have rejected the family's most recent petition to seek medical parole for Hu, who suffers from hepatitis B and serious liver damage. Zeng reports that an official told her: "Regardless of how serious his illness is, without major political environment, he has no chance of medical parole." I'm not exactly sure what Zeng (or, rather, the unnamed official) means by "political environment" means here, but my interpretation is that officials at Beijing Municipality Prison won't release Hu early without getting orders from above to do so and that such orders would likely only be issued if China's top leadership considered it politically expedient to do so. 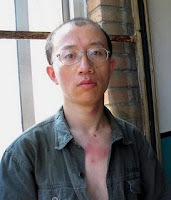 Or, reading between the lines: "Perhaps Hu Jia's serious medical condition would qualify him for medical parole if he weren't Hu Jia the renowned activist, but since Hu is so important to the international community, we are going to hold on to him as long as we can to see what we can get for him in return." This mentality—which critics deride as "hostage diplomacy"—was a regular feature of the Jiang Zemin era, with splashy releases of political prisoners on the eve of state visits by world leaders like President Clinton. But it has been conspicuously missing under Hu Jintao's leadership. Hu has been reported to find the practice personally distasteful, but there are probably larger factors at work as well. These days, Beijing can offer foreign leaders much more than the release of a few political prisoners, especially in light of the global financial crisis. Another possible explanation would be that the current leadership has concerns that releasing prisoners might be read as a sign of weakness, particularly by the more conservative wing within the Communist Party. Certainly, a gene for political risk-taking appears to be absent from the current leadership's genetic make-up. But, having said that, one cannot simply assume that a deal of some sort is totally out of the question. I'm guesing that the person who spoke to Zeng Jinyan is not in a position to know Hu Jintao's mind on the subject and was speaking in general terms, perhaps extrapolating from historical analogy. But a certain newly elected foreign leader who enjoys widespread popularity is slated to visit Beijing later this year. Perhaps personal intervention by this person would be just the kind of stimulus needed to convince Beijing to part with one of its most "valuable" political prisoners.